VMedia is bringing you a free preview of Bravo – home to feature films, high-profile dramas, and hit series such as Killing Eve, Suits, Carter and The Handmaid’s Tale. From now until May 1st, 2019, all VMedia subscribers will have free access to Bravo. 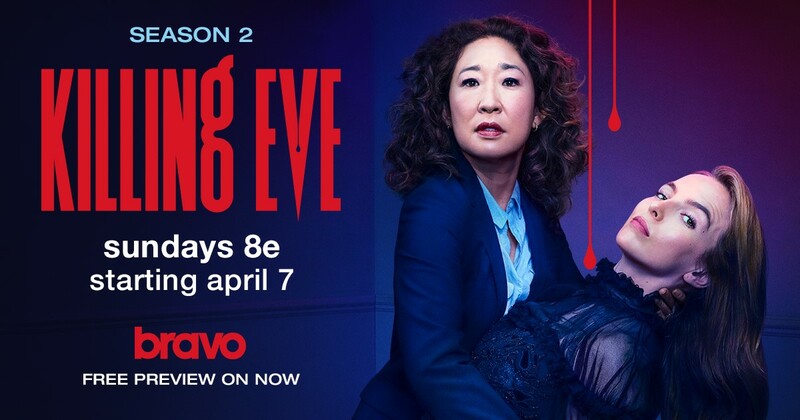 Golden Globe winning Canadian actress, Sandra Oh, returns as Eve for a second season as a bored low-level MI5 security employee fulfilling her desire of being a spy. The series picks up after the events of first season, which saw an injured Villanelle at the hands of Eve and promises a continued and increasingly dangerous game of cat and mouse as the two end up obsessed with each other. Top Model Karlie Kloss hosts this reality series featuring aspiring designers competing for a chance to break into the fashion industry. Each week, a designer will be eliminated from the competition after exhibiting their work in front of an esteemed judges’ panel. New judges for this season include former contestant Christian Siriano and Elaine Wentworth. Murphy, a 20-something blind woman, drifts through life in a drunken haze. She has two friends – Jess, her roommate and Tyson, a teenage drug-dealer who saved her from a violent mugging. Tyson stumbles upon a corpse while out for a walk with her guide dog, but it disappears before the police arrive. When the police don’t seem inclined to investigate, she takes it upon herself to figure out what happened to her friend, while managing her colourful dating life and a job she hates at “Breaking Blind,” a school for guide dogs owned by her overprotective parents. Bravo is available in our popular Premium Flex and Grand Premium TV packages for $28/month ($49.95 after 6 months) and $46.00/month ($67.95 after 6 months). You can also add Bravo to your TV lineup with our Knowledge theme pack or get it for as low as $1.50/month in our UChoose store. Sign up today! VMedia TV – More Content, More Enjoyment.